There is something so satisfying about seeing before and after project photos. 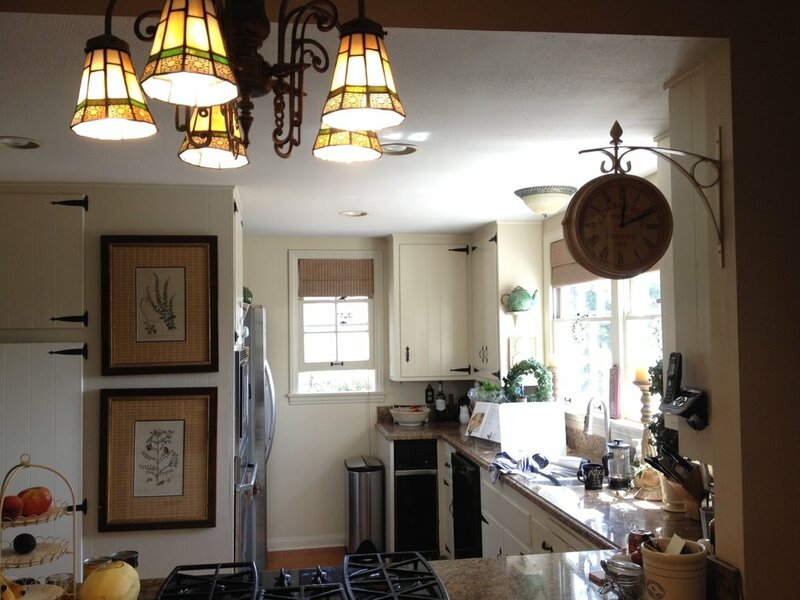 We recently wrapped up a complete remodel in Yorba Linda that transformed dark rooms into airy open spaces. Adding intentional details such as built ins and molding gave this family home the perfect amount of character and charm. You won’t belive the before and after photos, it doesn’t even look like the same house! We source an array of home accessories everyday and find that more retail stores are offering on trend accessories at a very reasonable price point. Fashion giant H&M has an expansive collection of bedding, kitchen accents and home decor. We have rounded up some of our favorite pieces that look much more high end than their price entails. As you have seen in many past projects we are no stranger to white linen bedding. H&M offers a very similar affordable option that comes in all sizes and plenty of colors. Their linen bed skirts and pillow shams are also a great clean addition to any bedroom. We are also loving their soft printed pillow covers and large fringe blankets that look great at the end of a bed or thrown over the arm of a sofa. H&M has no shortage of decorative and functional decor including a trendy circular mirror and oversized baskets which would work great as a storage piece or to house a tall leafy plant. 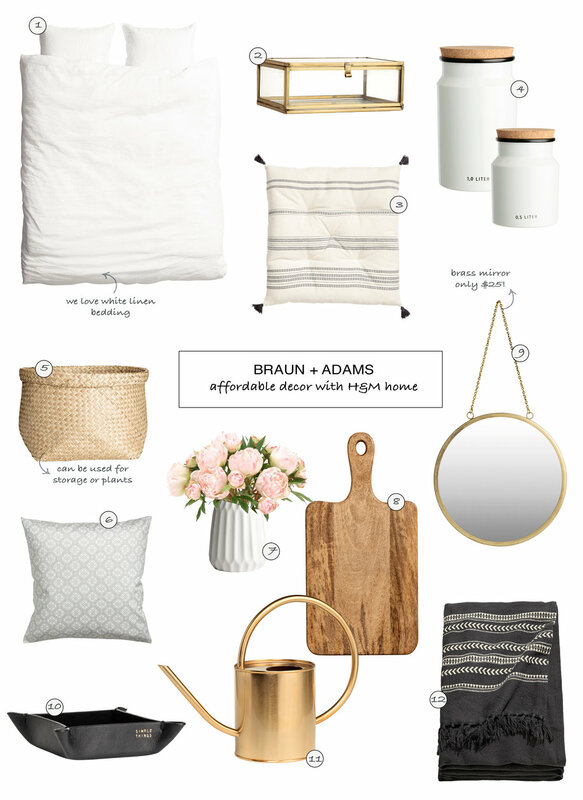 We are also a big fan of their brass watering can (which is so pretty it can stay out in the room) and their dainty accents like kitchen storage canisters and a black leather catchall. We're constantly sourcing hardware for kitchens, bathrooms, built-ins, custom furniture or even just dressing up IKEA hacks (which we've been doing a lot of!). We definitely have our favorites whether we are looking for modern, classic or a little fun. We have something in our vault for just about every style and every budget so figured it was time to share! What better way to follow our target roundup than with an IKEA roundup?! We are all about finding ways to keep those project budgets under control and it's no surprise our other favorite source for this is IKEA. There are a few staple pieces we've found ourself going back to time and time again so figured we just had to share…. 1. The KALLAX system (formerly known as the Expedit) - This amazing storage system is so versatile and there is nothing like it that even comes close in price. We love that you can mix and match cabinets, drawers and baskets with open storage to make just the right type of storage for your needs with a clean and simple design. 2. The DOCKSTA table - An impressive take on the classic tulip table. This works with a variety of different styles and the minimal assembly is always a perk! 3. RIBBA Frames - Available in so many shapes and sizes and now in white, black and gray. We especially love this simple frame when doing gallery walls since those can start adding up quickly. 4. SKOLD sheepskin - Now even better with the new much lower price! These are great for nurseries for a super soft space to crawl around on. The smaller RENS sheepskin is also a favorite, especially for throwing on top of a dining chair that needs a little extra cushion. 5. AROD reading lamp - We love how this is easily adjustable to conform to where it's going and can add a modern touch to just about any style space. Also available as a table lamp. 6. LINBLOMMA duvet cover and pillow cases - Oh how we love linen, especially for bedding. If you have kids and pets and can't stomach spending $300+ on a duvet then this is for you. And if white is still a bit scary it also comes in a lovely natural. 7. AINA curtain panels - Again with our love for linen! This may be the best IKEA bargain we've found yet at only $30/panel. These work great as a simple and affordable solution for light and airy white linen drapes to soften a space and add a little privacy. 8. RANARP lamp - White and Brass. Enough said. Also comes in a floor lamp, sconce and pendant now! The other room we did for this lovely young family was the Master Bedroom. The clients wanted this room to be light and bright like the front room but it was on the opposite end of the house where there was less natural light streaming in. There was also a serious need for more storage while also wanting to upgrade to a king so we needed to maximize every inch of space. We went with an overall light and airy color palette with lots of bright and warm whites but they didn't want it feeling too neutral so added some darker colors for contrast along with big bright pillows on the bed. 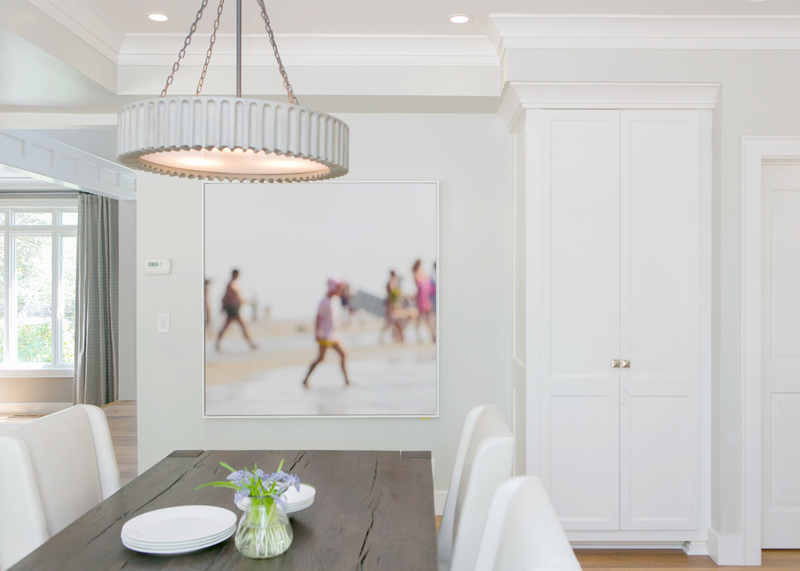 We also took advantage of those high ceilings to put in a dramatic chandelier which not only gives off great light but is a gorgeous addition to the room! 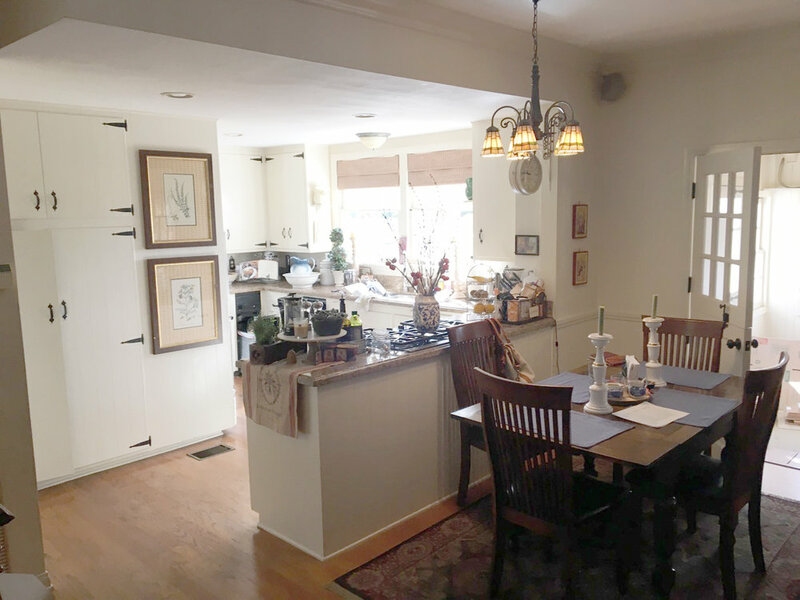 Check out what a transformation the room took…. One of the most impressive additions was the IKEA Pax wardrobe we completely made over for the space. We had to go with the shallower frame to make it work in the space but it still added a significant amount of storage. We gave it a fresh coat of Benjamin Moore Steep Cliff Gray and had custom mirrors cut to inset on the doors (which we upgraded to the hemnes doors). The mirrors drastically lightened up both the darker color of the pax and the room itself. And of course we had to finish it off with these brass bar pulls. The one other main challenge in the room was finding a king headboard and nightstand combo that fit on the wall where they would be going. We used these great nightstands that are not only small scale but still add some extra storage. And to keep the surface area open we did plug in sconces so there was no need to add electrical and the nightstands weren't being taken over by lamps. We're all thrilled with how this space turned out! And if you're feeling inspired to makeover your own Pax you can find a full tutorial here on Jenny Komenda's wonderful blog! 1. There is nothing better than curling up with a furry throw when it's blustery outside, and we love the warmth and texture they add to a space. Some of our favorite sources are OKL and West Elm where there are no shortage of options and usually on sale! 2. If faux fur just isn't your thing, this Etsy shop has some thick beautiful handmade wool throws straight from Uruguay. 3. Flameless candles have won us over! They are a great way to set a warm glow without the hassle or hazard of lighting a bunch of candles. These ones from Pottery Barn come fitted with a timer so you can set them for when the sun goes down. They're especially great for unused fireplaces. And notice these are suitable for outdoor use as well. Get some hurricanes and set them up on a table or hang them on branches. Even in cooler temps it's nice to enjoy an evening on the patio. And for those harder to reach places you can operate them with a remote. 4. All that said, it's also nice to have the real deal! This lovely gold 3 wick candle is long lasting so should make it through the holidays with it's subtle but festive scent. 5. Those big throws can't go everywhere with you but this versatile and silky soft cashmere scarf can. 6. Don't forget your feet! Lounging around home and enjoying your stylish digs is all the better when you're not walking around on any cold hardwood or tile. These Ugg Ansley slippers are soooo comfortable and plenty of great colors to choose from..
7. And speaking of feet, if you're stepping onto cold bare floors first thing in the morning consider treating yourself to a mini area rug to toss by the side of the bed. Makes for a softer start to the day! Something like this fringed flokati or a sheepskin work great and will add a nice touch to the bedroom without breaking the bank. 8. It's lovely to watch the leaves fall outside, but inside that doesn't have to be the case. Bringing in some life with a houseplant may not physically warm things up but it does make for a cozier atmosphere. One of our favorite plants is the fiddle leaf fig. Just make sure it gets some natural light or it will likely end up looking like the leafless trees outside. 9. Toss in a couple extra throw pillows here an there, and make sure there is some texture to them. The softer and fluffier the better, which is why we love sheepskin pillows. 10. And don't worry...if fur, real or fake, just isn't your thing then there are other great options to bring in that plush texture like this west elm shag lattice pillow or this big surya pillow from zinc door. Nothing finishes off a space quite as nicely as a pretty table lamp and we are always on the hunt for great ones. It was hard to narrow them down, but below is a round up of some of our favorites, from budget-friendly to splurge-worthy.